InArteSalus condivide dal sito www.philly.com questo articolo del mercoledì perchè la musica, e in questo caso il canto nello specifico, possono essere davvero una delle chiavi per garantire il benessere e la salute psicofisica dell’individuo, sia esso bambino, adulto o anziano, come dimostra questo articolo. L’imperativo dunque vien da sè: CANTIAMO! The scarf was clearly a hit, but what has changed life much more for the senior members in the Singing for Life Choir is, well, the singing. 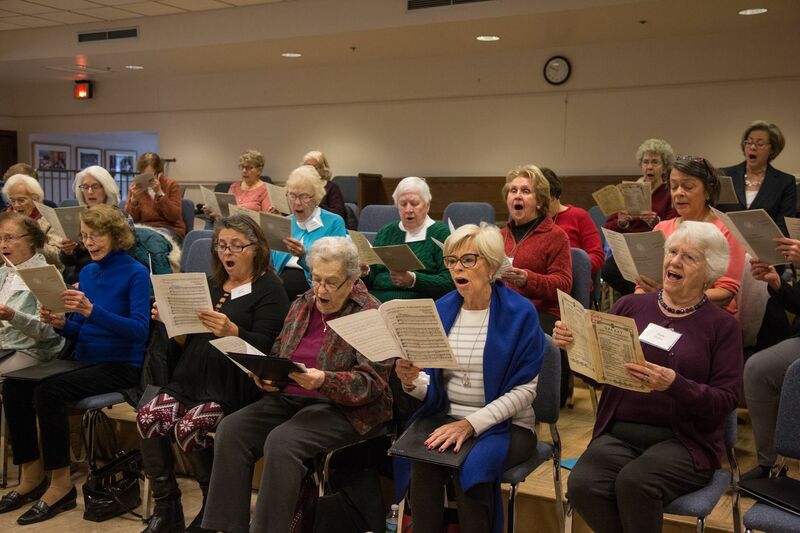 A study in a recent edition of the Journal of Gerontology: Psychology Sciences found that older adults who sang in a community choir for six months were less lonely and had more interest in life. The results are from a collaboration between the University of California, San Francisco and the nonprofit San Francisco Community Music Center, and the city’s Department of Aging and Adult Services that studied whether art-based interventions could be a low-cost way to help older adults. More than 32.5 million U.S. adults regularly sing in community choirs, the report noted. Researchers looked at 390 singers in 12 senior center choir programs for adults age 60 and older over a three-year period and found that those who remained in the group for six months experienced significant improvements in loneliness and interest in life. There was an overall six-month retention rate of 92 percent. The study stated there were no improvements in cognition or physical function, but Brillhart says his experience suggests otherwise. The choir does breathing exercises at every rehearsal. Those exercises and the act of singing give core muscles a workout, said Brillhart, who is also the music and artistic director of Philadelphia’s Singing City Choir. “We are very conscious of reinforcing the things that prevents falls and sitting without having back issues,” he said. Members are also asked to learn new songs in Swahili, Japanese, Arabic, French, Italian and Iroquois, he said, another way his singers challenge their brains. Annelouise “Pinky” Adee, 79, of Berwyn, said her posture and her stamina have improved due to stretching and breath work. “I just call it my painless cardio workout,” she said. For 89-year-old Jean Ruff, of East Falls, the choir lifts her spirit. She is able to forget everything else during practice and experiences complete joy. “It is very, very mindful,” Ruff said. The study results were not a huge surprise to Mary Muth, 65, of Doylestown, who sings with the Bucks County Choral Society, an audition-based 45-year-old choir for all ages in Doylestown. The Choral Society is Muth’s largest social group and she wouldn’t dream of missing a Tuesday night practice, even in bad weather. “The Choral is not just for seniors,” said Muth, a retired chemistry teacher from the Central Bucks School District. One of her former students just joined, she added. “Anytime you are involved in something multi-generational it keeps you young,” Muth said. Artistic Director Thomas Lloyd said there is a strong social aspect of belonging to a choir, which includes everyone in not only performing, but also in fundraising and marketing. “Because it is so fully engaging, it gives people something to do together to break the ice,” Lloyd said. Sue Johnson, vice president of the Bucks County Choral, joined the group 28 years ago because she wanted to be part of a community — while also getting time for herself, away from work and family duties. “I just wanted a group where I can go and have someone else tell me what to sing, and work on technique,” Johnson said. For Johnson, 65, the choral has become a family affair with her husband and daughter both members. It is also a big part of her social life. There are gatherings at member’s homes, dinners out and even vacations together. “We went to Italy last year,” Johnson said. It was vacation to the Umbria region and not a musical tour, she said. But “we did break out in song in the middle of the second floor of St. Francis of Assisi, music nerds that we are,” she said.